There are endless amounts of safety products to keep your home safe for the little ones, but most people forget about the garage. What if your child wanders in there? Will they be safe? Most of us keep the kind of bits and bobs in the garage that could be hazardous to children if they got their hands on them. 1. Ensure you keep the garage door locked at all times when not in use so the little ones can’t go inside when unsupervised. 2. Keep all harmful substances hidden away and up high so the kids cannot reach them. Do not keep brightly coloured pots and tins visible as it only causes temptation for them to climb up to get it – which could cause a disaster. 3. Do not store liquids in any cartons which children may associate with liquids they drink. 4. If you have an electric automated door, ensure that you test all functionalities on a weekly basis to make sure it won’t harm anyone – especially children. You can test this by making sure that it automatically reverses if anyone is below its sensor line. If for any reason it doesn’t automatically reverse – contact us immediately for assistance. 5. Ensure all doors in reach of a child are locked. This also includes cars, washing machines, refrigerators and freezers as children may see them as hiding places. 6. Lock all power tools away, out of the reach of a child to prevent any accidents – this includes lawnmowers, they need to be secured against the wall with a lock to ensure maximum protection. 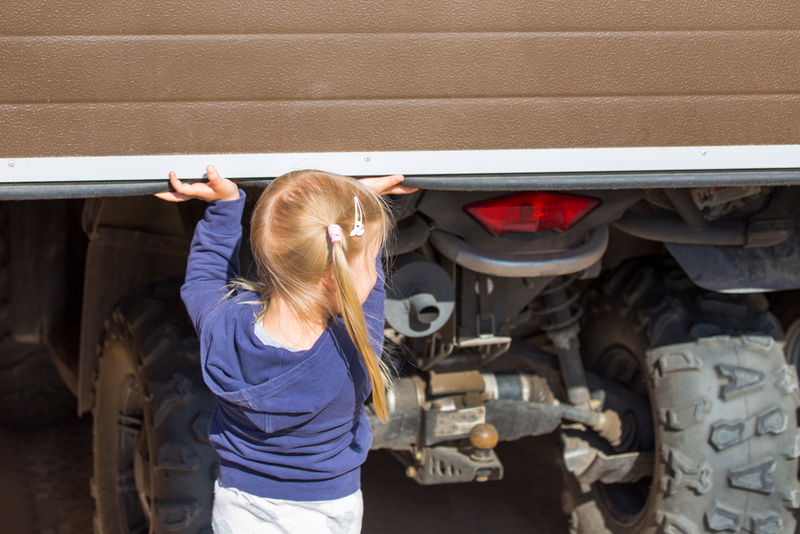 Ensuring your garage is child-proofed is essential for their safety. We offer ‘up and over’ garage doors as well as automated garage doors, so don’t hesitate to get in touch as we’ll be happy to help.